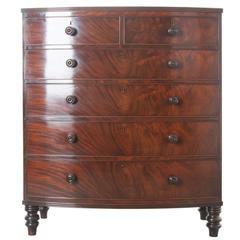 Federal period Mid-Atlantic American bow front mahogany chest of drawers with some very unusual details. 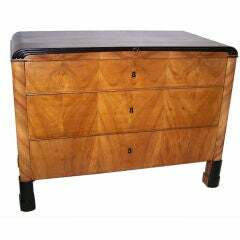 Four graduated drawers, crossbanding around a part of the top, satinwood inlaid dental detailing around the bottom edge of the top with string inlay around the drawer fronts and in the canted corners. 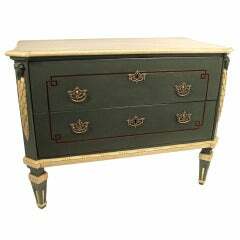 All four feet on the chest are French splayed feet with again satinwood inlay stringing. Brass Bale handles appear to be original, secondary wood is poplar, American, circa 1820. Mid-Atlantic, possibly Baltimore. 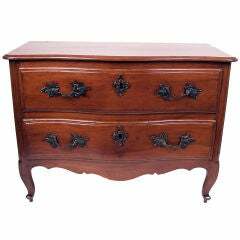 A 19th century fruitwood Biedermeier style three drawer chest with ebonized details. Original condition with beautiful old finish. 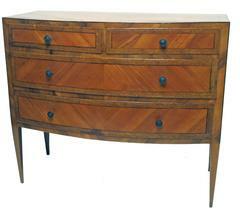 A 19th century walnut bow front commode with inlaid satinwood detailing. 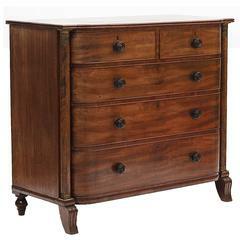 Having two short drawers over two graduated long drawers on tapering square legs, Italy, circa 1860. 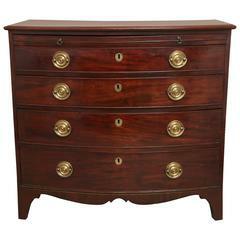 Louis XVI Style Walnut Two Drawer Commode on cabriole leg with scroll foot. Orginal pulls and escutheons. French, Circa 1830. 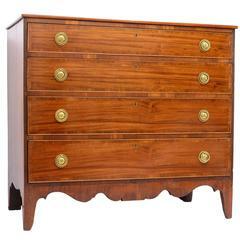 Federal Sheraton Bow Front Chest with string inlay, cookie corners and fluted columns, period early to mid 19th c.
With deep rich color and lively figure; the fitted with a brushing slide over four graduated, cockbeaded drawers with brass pulls, above the scalloped apron and outswept feet.